Starting high in the Rocky Mountains in central Colorado, the Colorado River runs through the Grand Valley, passing the towns of Palisade, Grand Junction, and Fruita on its way to the Gulf of California. After the mighty river exits Debeque Canyon from the east, it ebbs and flows west along the southern edge of the valley, passing boat launches and riverside ponds, before dropping into a series of deep canyons. The Colorado River Corridor, offering loads of fun for rafters, kayakers, canoeists, and stand-up paddlers, is an ideal place to visit during the hot summer months. A good place to start is the James M. Robb-Colorado River State Park—a 15-minute drive from downtown Grand Junction. With easy access to the river, as well as opportunities for fishing, hiking, camping, and picnicking, it’s a wonderful place to spend a weekend. Corn Lake is the best spot to go fishing, with two wheelchair-accessible fishing piers and offering healthy populations of largemouth bass, crappie, bluegill, and channel catfish. Colorado Parks and Wildlife also stocks the lake with thousands of rainbow trout each year. Connected Lakes is another part of the park, made up of four lakes, and situated on the southern edge of the Colorado River. Paddle or take a walk around the lakes, cast a line in the water, or launch your raft into the Colorado River from here. If you decide to stay at the park for the weekend (or longer), the campground in the Fruita Section is a great home base for spending hours canoeing and stand-up paddling on the park’s Bookcliff and Red Rocks Lakes, with views of the Colorado National Monument in the distance. There are more than 40 campsites here, some with electrical and full hook-ups. Visit the park’s website for more information and to make reservations. Located just outside of Grand Junction, Highline Lake State Park is another popular getaway for paddlers and boaters of every persuasion. The 160-acre Highline Lake gets busy on hot days, with powerboats towing water skiers and jet skis plowing through water that reaches 80 degrees by August. The lake’s north end is wakeless, though, perfect for canoes and kayaks. The smaller Mack Mesa Lake is a serene spot for boats either hand-propelled or with electric motors. Keep an eye out for waterfowl, including pelicans, snowy egrets, Canada geese, and great blue herons. In the spring, fishermen may have to compete with bald eagles vying for the thousands of trout that have just been stocked in the two lakes! The park also offers a shady campground, plenty of hiking, and nearby mountain biking trails. 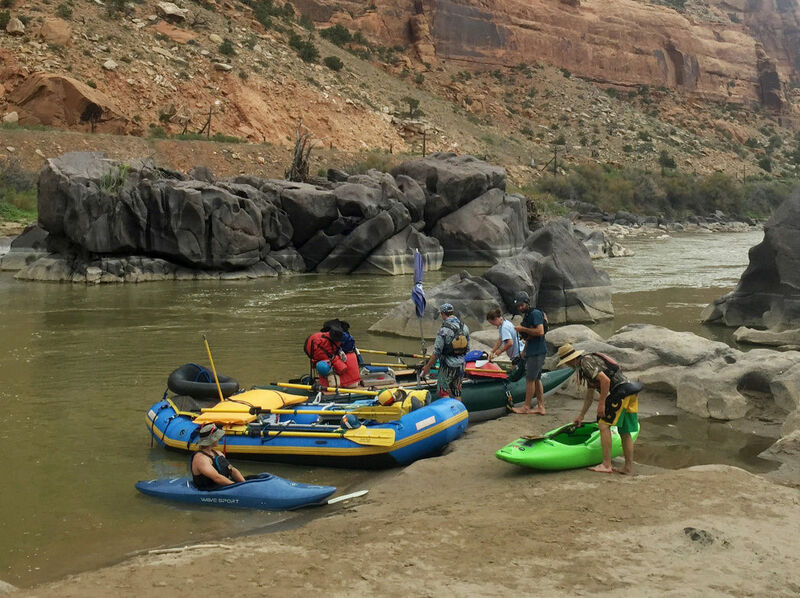 The Colorado River is bookended by Ruby, Horsethief, and Westwater Canyons on the west as it flows into Utah, and the canyons offer excellent whitewater rafting between towering sandstone cliffs. The brown river, swollen with snowmelt in May and June, sweeps through Ruby and Horsethief Canyons with long stretches of placid water punctuated by minor riffles and tamer rapids. The river’s 25-mile-long Ruby-Horsethief Canyon segment west of Fruita is the best river run for private boaters, with lots of flatwater as well as an exciting class II rapid at Black Rocks. The gorgeous red rock canyon, busiest on summer weekends, offers a smorgasbord of scenic views and lots of hiking. If you want to get your bearings on solid ground, take the 15.5-mile trek along the Rattlesnake Arches Loop, home to the second-highest concentration of natural arches outside of Utah. Many campsites are scattered along the river here too, making it a great overnighter. Note: The BLM requires permits for camping to reduce impact. 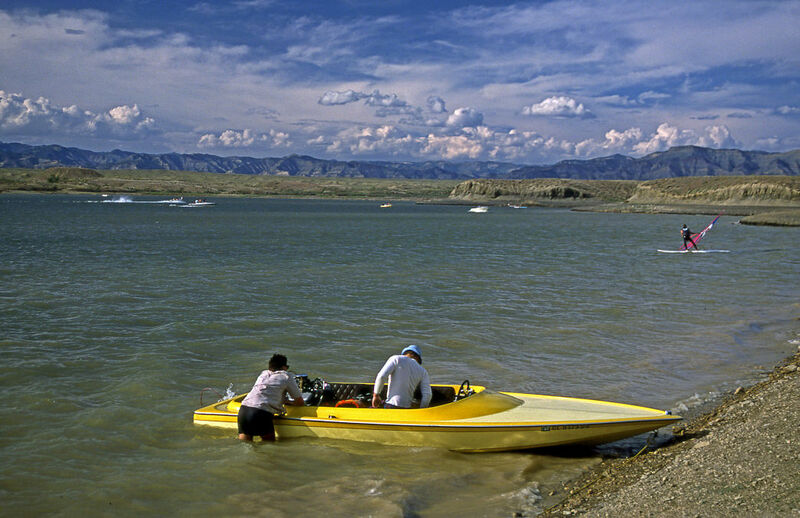 The stretch of Colorado River between Palisade and Fruita is ideal for do-it-yourself boaters. Rent everything you need from life jackets and rafts to kayaks and inner tubes in Grand Junction, and hit the river. A good 17-mile float is from the boat launch at Palisade’s Riverbend Park to Redlands Parkway Boat Ramp on the west side of Grand Junction. Most of the river is flat water with occasional riffles, so grab your inner tube and some sunscreen and you’ll be set! The Western Slope area is also becoming known as Colorado’s Wine Country, so look for a wine country float trips to really relax into your vacation to Grand Junction. If you’re into stand-up paddleboarding, the Colorado is the state’s best SUPing river, with miles of calm water ideal for novice paddlers. Take a lesson from a local outfitter and rent the essentials for a fun float on the river. The Grand Valley runs from Palisade to Corn Lake, and from Corn Lake to Fruita are perfect for anyone trying to get the hang of the board. After that, hire a guide service and take a two-day trip down Ruby and Horsethief Canyons. (Expect red rock scenery and a core workout on this one!) To escape the summer heat, head for Grand Mesa and go SUPing on hundreds of lakes and ponds above 11,000 feet in elevation. It’s usually much cooler on the mesa, sometimes by as much as 20 degrees. From smooth lakes in state parks to rapids on the Colorado River, it’s easy to see why many consider Grand Junction to be a great base camp for getting on the water on Colorado’s Western Slope. And with plenty of outfitters ready to help you get out there, there’s no excuse why you shouldn’t start planning your next trip right now! Originally written by RootsRated for Grand Junction Visitor & Convention Bureau.